Peter Jackson’s Lord Of The Rings trilogy from 2001, 2002 and 2003 was truly brilliant and groundbreaking. The Hobbit takes place approximately 60 years before Lord Of The Rings. I have read The Hobbit novel a long time ago, and originally I did not understand how a book of 300 pages could be turned into three films. Apparently, Peter Jackson and his crew have included things from both Lord Of The Rings and The Silmarillion. I did never read The Silmarillion, but apparently the book should be based on events that lead up to both The Hobbit and Lord Of The Rings. Without going too much into detail, there is no doubt that Tolkien’s universe is rich in both fantasy and mythology. In this movie, Gandalf and 13 dwarves are on heroes journey through Mirkwood, Lake Town and Erebor in Tolkien's Middle Earth. The new Hobbit prequel trilogy does not feel as inspired and fresh as the original Lord Of The Rings movies. However, this second hobbit chapter is still a good adventure movie. Martin Freeman is good as the young version of Bilbo Baggins, and Ian McKellen repeats his signature role as Gandalf with success. I also like Luke Evans as Bard The Bowman. The movie contains tons of CGI. Smaug (the dragon) is scary and threatening (well done by Weta Workshop). The makeup of the 13 dwarves is done professionally, but I was still not able to tell them apart when the movie ended (Thorin Oakenshield is an exception). Overall, the special effects are on a high level. The score is beautiful and bombastic (as in Lord Of The Rings). I watched The Desolation Of Smaug in 3D HFR. The HFR format did not give me a headache. 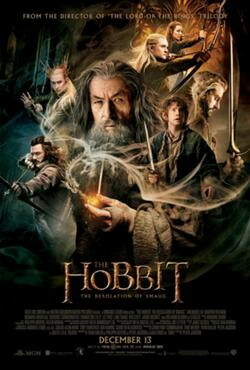 I liked what Peter Jackson did with this movie, and I am already looking forward to the third part of The Hobbit. The ending is a cliffhanger, so be warned!